On Friday afternoon, I had the opportunity to join both lower and upper school teachers from Penn Charter School in Philadelphia to discuss the flipped learning model. Many of the teachers were familiar with the term flipped learning, but had questions about what the approach looked like in a humanities classroom. Isn't the flipped model something that English and history teachers already do? And the answer is...sort of. Flipped learning is not just about students watching videos as homework. Instead, the flipped approach is very similar to inquiry-based and problem-based learning pedagogies in that at the heart of the flipped approach are students. This students-centered learning approach allows for student exploration of concepts with opportunities to practice and master skills using teacher created and curated materials that students have access to both inside and outside of the classroom. Teachers act as facilitators, mentors, and coaches, helping guide students through these learning opportunities. What this means for me as a high school English teacher is that I use a great deal of formative assessment in order to determine what skills and higher order learning activities my students are struggling to learn. These are the learning opportunities that should happen with my support inside the classroom. As an English teacher, I had previously assigned my students chapter-by-chapter reading homework. However, if my students are struggling with reading comprehension, this "homework" is doing more to hinder their learning than to support it. The same is true of teaching writing. Previously, I expected my high school students to draft their essays outside of class. But this didn't make sense when my students were struggling to compose their thesis statements. The skills that students struggle with need to be flipped into the classroom. Now, we begin all of our writing activities in the classroom where students have support from both their teacher as well as from their peers. For those new to the idea of flipping the English classroom, I wanted to take a moment to share some of the resources that I have found helpful in my flipping adventures. I am by no means an expert, and as I shared with the teachers at Penn Charter on Friday, most of my learning about this approach happened as I did everything exactly wrong. Imagine students sitting at home watching 25 minute long videos on sentence fragments. Yikes! So to help other teachers avoid my mistakes (and wasted time creating truly awful videos), I've compiled some of my favorite tools. If you are new to flipped learning, start with the pillars of Flipped Learning shared by the educators at the Flipped Learning Network, an online forum for teachers to share their resources and questions about flipped learning. This document is a great introduction to the basics of the flipped approach, emphasizing the how the approach encourages a student-centered approach to learning. Aaron Sams and Jon Bergmann’s book Flip Your Classroom was a valuable resource in helping me think through why and how to flip. This fast read also discusses how the flipped approach can be used to encourage mastery learning goals. Troy Cockrum’s book Flipping Your English Class includes not only chapters to help teachers think through the theory underlying the flipped approach, but also includes specific lessons for English teachers interested in trying the approach. Each lesson is presented twice, first using a traditional flipped model for those teacher first implementing this approached and then as a second iteration flipped lesson with ideas for encouraging differentiation and mastery. If you are interesting in understanding the difference between these two approaches, check out this excerpt from the book with two example lessons. Jason Bretzmann’s Flipping 2.0 includes chapters by English teachers Kate Baker, Cheryl Morris and Andrew Thomasson, and by Troy Cockrum. Teachers discuss how they got started, the missteps they made along the way, as well as what they found most helpful to consider when getting started. Twitter is an invaluable resource for teachers of all disciplines, but in particular, you will find a lot of flipping teachers use Twitter to share their resources and collaborate. So, what flipping English teachers are on Twitter? Here's my list of flipping English teachers. Kate Baker blogs about her high school English flipping experiences at Baker's B.Y.O.D. Cheryl Morris and Andrew Thomasson, gurus of collaboratively flipping their cross-country high school English classes, can be found online on their collaborative flipping blog. Troy Cockrum hosts a podcast with flipping teachers. Make sure your materials and videos display your personality. Students want to see and hear you in the presentation. The less clicks the better; embed the video. Students must do something as they watch in order to help them practice the skill featured in your video. Consider having them take notes, craft questions, or respond to a class blog or discussion website. TedxEd is fantastic! Pull in any YouTube video, create multiple choice or open ended questions to go along with the video, and use teacher-created student accounts to have students respond. There are a wealth of lessons already created and shared, or you can create your own. Khan Academy has a great deal for science and math teachers, but more and more humanities lessons are being added. 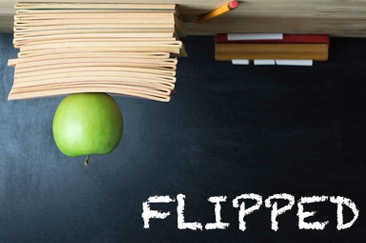 Find example lessons shared at the Flipped Learning Network and on the Flipped Classroom Ning. And while you are there, join the Ning network of flipping teachers!